The twig, from the black spruce, is in two year-growths to represent the past and future of Labrador. The shorter growth of the inner twigs represents the hardships of the past, while the outer twigs are longer as a representation of the hope Labradorians have for the future. The three branches represent the three founding nations of Labrador; theI nnu, the Inuit, and the white settler. The three branches emerging from a single stalk represents the unity of the distinct peoples in the brotherhood of mankind. Cultures that had existed for centuries traveled by foot and watercraft. The Inuit who inhabited the coast had used kayaks and umiaks to follow the seals and the whales; the Innu, occupying the interior, had canoed thousands of miles on some of the great rivers of North America. And in the winter both had employed dogs to pull their komatiks and their sleds. In the 1960s the snowmobile replaced the dog as power transport and today it is well established as the winter vehicle of choice all over Labrador. People have lived in Labrador for 9,000 years. During this time the area has been home to a variety of cultures: prehistoric Inuit; the so-called Maritime Archaic people who have evolved into today's Innu; Europeans who came to exploit the resources of the land and the sea. For any number of reasons, Europeans decided to stay and make a home in Labrador. A new way of life and new cultures were born as they learned from their Aboriginal neighbours and adapted to the demanding environment. 21st century Labrador is a mixture of vibrant and dynamic cultural groups who share a history of reliance on the resources of the land and the sea. The Virtual Museum of Labrador invites you to explore our history and learn about the forces that have shaped Labrador and its people. Labrador has a population of approximately 28,000 people (census 2001).Approximately one third of the population lives along Labrador's 7,886 km coastline, while one third live in the Lake Melville Region, and another third live in Labrador West. Labrador has five Regional Economic Development Zones which reflect fairly accurately the climatic, cultural, historical and economic differences in the regions. There are four distinct and separate cultures in the region, the Inuit, the Innu, the Metis and the Settlers. In Labrador, the Innu, Inuit and Metis are referred to as aboriginal people. Labrador also has a French presence in Labrador West and the Straits area, due to its proximity to the province of Quebec. Labrador, known by Labrador residents as the "Big Land", has an environment shaped by its geology, geographic position and closeness to the Labrador Current and Gulf Stream. Labrador is the most eastern landmass of the Great Canadian Shield and contains some of the most ancient rocks and unique flora known to mankind. Out of all that's known of Labrador, the one obvious feature spoken of by scientists and researchers, is that Labrador is an unexplored geological and biological treasure with mysteries abound. On Jan 22, 2005, the Inuit of Nunatsiavut signed an agreement with the federal and provincial government covering 72,520 square kilometres of land, including the entire northern salient of Labrador north of Nain as well as a portion of the Atlantic coast south of there. The agreement also includes 44,030 square kilometres of sea rights. Although the Inuit will not own the whole area, they will enjoy special rights related to traditional land use, and they will own 15,800 square kilometres designated Labrador Inuit Lands. The agreement also establishes the Torngat Mountains National Park Reserve in the northern area of the land claim. The package also includes $130 million in compensation for the forced relocation of the Inuit in the 1950s; provincial royalties for resources; land, mineral, and marine rights; and $120 million to establish self-government. The agreement was ratified by the Labrador Inuit and by the legislative assembly of Newfoundland and Labrador; passed by the federal Parliament, it received Royal Assent on Jun 22, 2005 The land claims agreement provides for the establishment of a Nunatsiavut Government to represent not only the residents (Inuit and non-Inuit) of the land claims area, but also Labrador Inuit living throughout Canada. Although Nunatsiavut will remain part of Newfoundland and Labrador, the Nunatsiavut government will have authority over health, education, and justice in the land claim area. Nunatsiavut operates under a consensus form of parliamentary government.According to the agreement, the government of Nunatsiavut will be based in Hopedale and Nain. Sometimes as a quiet glow, almost fog-like in character. As vertical streamers with considerable motion As a series of luminous expanding arcs As curtains, fans, flames, or streamers of various shapes. Scientists tell us that auroral displays occur when charged particles from the sun interact with gases in the earth's atmosphere. 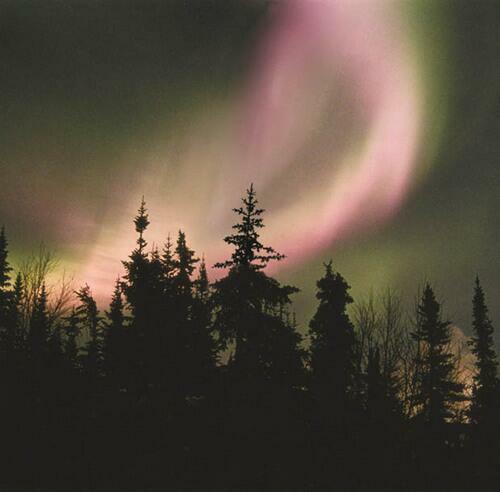 Canada's aboriginal peoples possess a rich store of cultural beliefs regarding the Northern Lights. Whatever the explanation, the shapes, movement and colours of the Northern Lights are extremely beautiful. 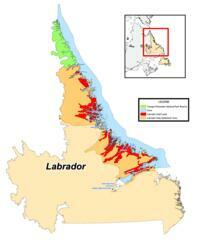 Iron Ore mining is the main industry and economic base in Labrador West, and has been so for over thirty years. The area is the Iron Ore Capital of North America, with the largest ore concentration and yearly yield on the continent. The three major mines in the area, Wabush Mines, The Iron Ore Company of Canada (Lab City) and Quebec Cartier Mining, based 40 km away, together produce 95% of Canada's iron ore, with exports of over 20 million tons annually. In 1995 IOCC was the provinces second largest source of revenue. As the mining industry continues to diversify, and the areas mining activities expand, Labrador West continues to blossom with new opportunities for business. Over the past few years a new dolomite mine has opened, the stone utilized in the iron ore production at IOCC to improve the quality of the finsihed product. The East Coast Trail is a 540 km coastal hiking experience that takes you to the outermost reaches of North America. The Trail provides hikers with a special blend of wilderness adventure, outstanding natural beauty, wildlife, history, and cultural contact. The Trail takes you past towering cliffs and headlands, sea stacks, deep fjords, and a natural wave-driven geyser called the Spout. It provides access to abandoned settlements, lighthouses, ecological reserves, seabird colonies, whales, icebergs, world's southern most caribou herd, historic sites, a 50-metre suspension bridge, two active archaeological dig sites, and many more attractions. It offers a wilderness paradise of boreal forest, fresh clean air and quiet solitude, all combined with the raw natural beauty of the rugged Atlantic Ocean. In addition, the Trail links together 30 historic communities providing services, such as accommodations, dining, and entertainment. Our business members live and work in these communities and are available to help you plan your trip, provide the services you require, or supply the information you need.